4 Does the Similarity Between the Regulation of Necroptosis and of Assembly of the NLRP3 Inflammasome Reflect Activation of the Inflammasome by Products of Necrotic Cells? 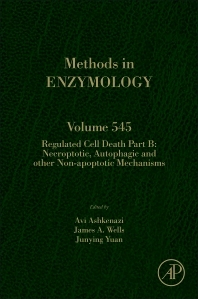 Regulated Cell Death Part A & Part B of Methods in Enzymology continues the legacy of this premier serial with quality chapters authored by leaders in the field. This volume covers research methods in apoptosis focusing on the important areas of intrinsic pathway, extrinsic pathway, caspases, cellular assays and post-apoptotic effects and model organisms; as well as topics on necroptosis and screening approaches. Dr Avi Ashkenazi received his PhD in Biochemistry in 1986 from the Hebrew University of Jerusalem, Israel. From 1986 to 1989 he trained as a postdoctoral fellow at the University of California, San Francisco, and the biotechnology company, Genentech. As a postdoc, he helped identify the muscarinic acetylcholine receptor gene family and deciphered its interactions with specific G proteins – work that in 1988 earned him and two of his colleagues the first prize of the Boehringer Ingelheim Award. In 1989 Dr Ashkenazi joined Genentech as s Scientist and progressed through the ranks to become Senior Staff Scientist and Director, most recently within the Research Oncology division. In the early 1990’s he contributed to the development and translation of a technology to fuse immunoglobulin Fc domains to other proteins, now used in numerous research laboratories and in important biotechnology drugs including Enbrel® and Eylea®. Subsequently, Dr Ashkenazi’s laboratory discovered several novel members of the tumor necrosis factor (TNF) superfamily, most notably, the apoptosis-inducing ligand Apo2L/TRAIL and its “death” and “decoy” receptors. Dr Ashkenazi’s basic research has focused on the mechanisms of apoptosis signaling by death receptors, and his translational work in this area pioneered the clinical development of pro-apoptotic receptor agonists (PARAs) for cancer therapy. To date, Dr Ashkenazi has published 110 research papers and 31 review articles and has co-edited a book on antibody fusion proteins. His top 5 publications have been cited in sum over 11,000 times. His work on death receptors is highlighted in the textbook: “The biology of Cancer” by Robert A. Weinberg. He has presented 99 lectures at scientific institutions and conferences and is a named inventor on 59 issued US patents. Dr Ashkenazi co-chaired the international TNF conference in 2007 and has served or serves on the editorial boards of Current Biology, Clinical Cancer Research, Nature Reviews Cancer, Journal of Biological Chemistry, Cancer Biology & Therapy, Cell Death & Differentiation and Molecular Cancer Therapy. James A. Wells, PhD, focuses on development of enabling technologies for engineering proteins and for identifying small molecules to aid in drug discovery for challenging targets such as allosteric regulation and protein-protein interactions. He is interested in the discovery and design of small molecules and enzymes that trigger or modulate cellular processes in inflammation and cancer. Using small molecules and engineered proteins, the Wells lab is studying how activation of particular signaling nodes involving protease, kinases, or ubiquitin ligases drives cell biology. The lab has focused much on a set of proteases, known as caspases, responsible for fate determining cellular decisions involved in apoptosis and innate inflammation among others. These enzymes act as cellular remodelers and help us understand the essential protein struts that support life. These targets also provide leads for developing new cancer therapeutics and biomarkers for cancer treatment. Wells is a professor and chair of the Department of Pharmaceutical Chemistry in the UCSF School of Pharmacy. He holds a combined appointment as professor in the Department of Cellular & Molecular Pharmacology in the School of Medicine. He joined UCSF in 2005 as holder of the Harry Wm. and Diana V. Hind Distinguished Professorship in Pharmaceutical Sciences. Wells also founded and directs the Small Molecule Discovery Center (SMDC) located at UCSF’s Mission Bay campus. He earned a PhD degree in biochemistry from Washington State University with Professor Ralph Yount in 1979 and completed postdoctoral work at Stanford University School of Medicine with Professor George Stark in 1982. Before joining UCSF, Wells was a founding scientist in Genentech’s Protein Engineering Department and in 1998 co-founded Sunesis Pharmaceuticals. Wells is a recipient of the Hans Neurath Award by the Protein Society, the Pfizer Award and Smissman Award given by the American Chemical Society, the Perlman Lecture Award given by the ACS Biotechnology Division, the du Vigneaud Award given by the American Peptide Society, the Merck Award from the ASBMB and in 1999 a member of the National Academy of Sciences.